I have tried to donate every year to the Jack Vasel Memorial Fund Auction. So far I’ve only missed one. This year, in addition to a few other games, I’m donating a print copy of Mars Colony: 39 Dark. The high bidder gets a copy shipped to him or her. If you’re in the U.S., shipping is free. Otherwise, I pay the first $5. Please bid generously as all of the proceeds go to the Memorial Fund. The Jack Vasel Memorial Fund was started in April, 2011, in memory of Jack Vasel, son of Tom Vasel. Tom is an influential voice in the board gaming hobby, and the community rallied around him in his time of need. Amazed by this generosity and kindness, Tom was determined to help others who might undergo similar tragedies. The purpose for which the Fund is formed is to collect and provide financial assistance to members of the public who are part of the gaming community and who have suffered personal hardship. It is our hope and prayer that the Jack Vasel Memorial Fund will provide Jack with a legacy to help out the entire gaming community. The Fund is recognized by the IRS as a 501(c)(3) tax-exempt charity. I also recommend reading a few of the stories posted by people who have received help from the Fund. I assure you, they will tug at your heartstrings. This entry was posted in Announcements and tagged 39 Dark, charity on October 26, 2014 by Tim Koppang. 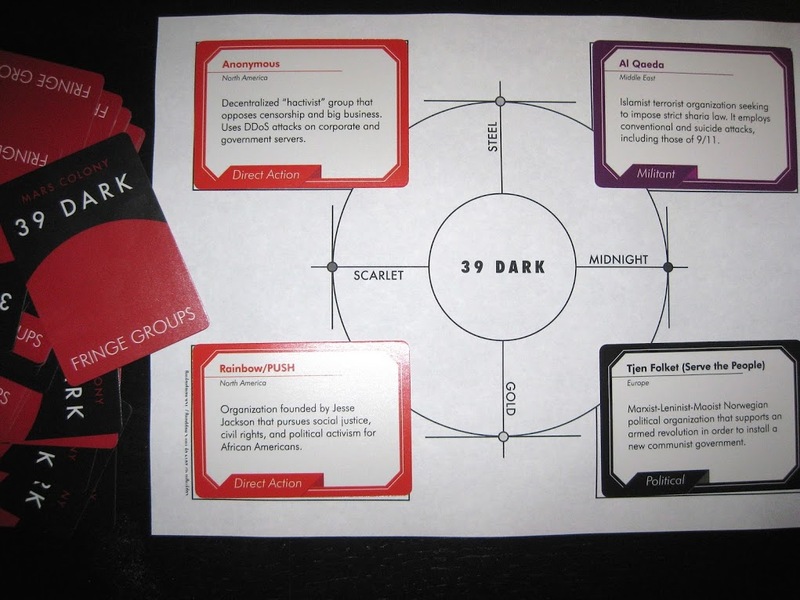 I was surprised at just how difficult it was to come up with 32 different fringe groups for the 39 Dark Kickstarter reward. It wasn’t that there was a lack of groups. Rather it was difficult to choose 32 groups that, as a whole, represented a sufficiently multi-national swath. I also wanted to amass a collection of groups that represented both the right and left, extremist and peaceful side of protest. I’m sure I’ve failed on at least one front, but I’m nonetheless happy with the collection. What I realized was that it’s impossible to capture the spirit of protest around the world in a simple deck of cards. But I also realized that I can make some pretty darn interesting combinations from the deck I did create. Available now for purchase. This entry was posted in Announcements, Design and tagged 39 Dark on October 25, 2014 by Tim Koppang.